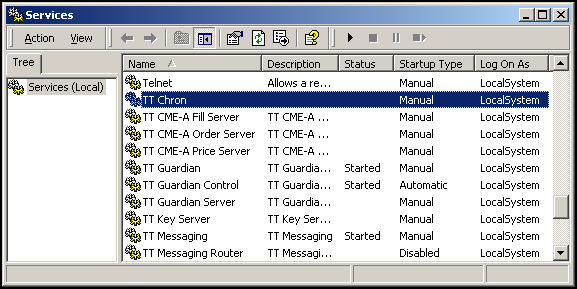 Each TT Gateway installs the scheduling utility TT Chron (ttchron.exe) as a Windows service. After installation, you must set TT Chron up for Automatic Startup in the Windows Services dialog box. For this procedure, refer to Setting TTChron for Automatic Startup. Scroll down the list in the Services dialog box to locate TT Chron. For all Job Sections, whenever a process is set to run, TTChron starts the process with any associated arguments. After starting a process in this manner, TTChron does not monitor or try to stop the process. If the process terminates before scheduled to do so, TTChron revives it. If a program is running when it is not scheduled to do so, TTChron terminates it. TTChron writes to a log file named TTChron_MMDDYYYY.log which it saves into <root drive>:ttlogfiles. Sometimes when a process or service fails, it generates a prompt box that warns the administrator of the error. Until someone closes this prompt box, the process or service does not shut down completely. To avoid a scenario where a process or service hangs in such a manner (especially if you schedule TTChron to restart the process or service), TTChron automatically closes the prompt box by mimicking a click on the prompt box's OK button. By closing the prompt box, the failed program can fully terminate. TTChron checks for these error messages every five seconds. Using the Services dialog box: Right-click TTChron and click Start.